These machines will clean the glue residue from the back of membrane pressed panels and soften the edge in a single pass using specially designed rotating brushes on a carousel. They have long life brushes and require no chemicals or polishes to achieve a perfect finish. They're simple to use and have been designed to need no setting or intervention form the operator regardless of the dimensions or thickness of the panels. Parts are placed faced down on the conveyor belt after trimming. As the panels enter the machine their position relative to the cleaning head is measured, which instigates the lowering and raising of the brushing units relative to the panel. This prevents damage to the leading or trailing faces of the components or dubbing of the top edge. The machine senses the thickness of the panel and lowers the working head accordingly so that all panels receive exactly the correct amount of top pressure to remove the glue residue without damaging the rear face. 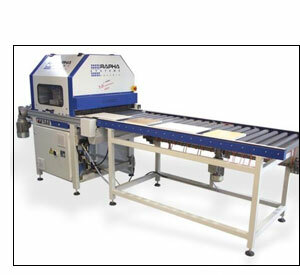 The cleaning process also gently softens the edge of the panel producing a fully finished panel in a single pass. Based on an average size of 650 x 400mm the RBM 1500 is capable of cleaning 1,500 - 2,000 parts in a single shift, whilst the RBM 200 will deliver up to 4000 in the same period. For ease and quick cleaning of the board and softening the edges after pressing. Using special pads the remaining glue will be taken away simply and easily without damage to the surface of the parts. Many solutions have been tried involving various chemicals and solvents most of which leave a residue and smears on the back of the panel. Some of which can potentially attack the glue-line. 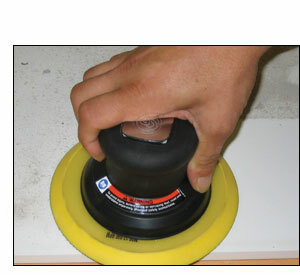 This small buffing tool will remove the residue of adhesive on the back of the panel without the use of chemicals and leave a clean unmarked finish. The pads are long lasting and quickly changed working out comparable in cost to solvent cleaners.